The Puerto Vallarta countryside in Western Mexico is one of the most unique ecological environments in the entire country. The city is positioned between three different mountain ranges, creating the unique and diverse plant and animal wildlife that is found just a few miles from the city center of Puerto Vallarta. The north side of the city has a more deciduous forest type of wildlife and the east and south side feel more like a sub-tropical jungle. The Juntas de los Veranos, where you will find our Canopy Adventure Tours, is one of the tropical forests of Puerto though, located about 1600 meters above the sea, Los Veranos is considered a Tropical Deciduous forest. This basically means that the forest is most alive and thriving during the rainier months of the summer when the forest sees an average of 70 inches of rain. The type of plant wildlife you can expect to find in Los Veranos include the massive Capomo trees whose seeds are processed and used to make decaffeinated coffee. Other plants you will walk past on your canopy adventure include vanilla vines, all kinds of orchids, Strangler Fibs, rubber trees, palms, bamboo, and the plants that are used to produce tequila, agave planets. Los Veranos is also filled with over 400 species of tropical and migratory birds. These include the Tropical Kingbird, the Great Kiskadee, Amazonian parrot, the Blue Footed Booby, the Hooded Oriele and many more. These are the types of birds you see in pictures of the rainforests, with prominent beaks and brightly colored feathers. 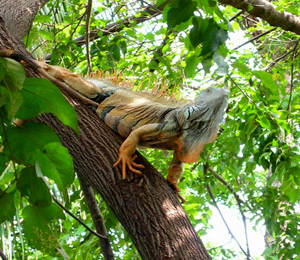 The land trotting animals you can expect to spot around Puerto Vallarta and in Los Veranos include the white tailed deer, pumas, jaguars, rabbits, skunks, badgers, coyote, margays, wild boars, jaguarondi, armadillos, and various kinds of iguana.